After months of hard work, MadgeTech has successfully implemented a quality system designed to consistently produce reliable, high-quality data loggers. 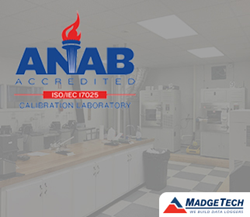 Working in conjunction with ANAB Accreditation, MadgeTech has recently received its ISO/IEC 17025 certification! By becoming an ISO/IEC 17025 certified calibration laboratory, MadgeTech is going above and beyond industry standards to provide its customers with superior services. This recognition not only improves company procedures by ensuring they be carried out correctly and efficiently every time, but also confirms the abilities of MadgeTech’s Calibration Laboratory Technicians. Most labs must hold this international accreditation to validate they have met industry recognized requirements for measurement traceability needed to work with medical, clinical and inspection facilities worldwide. With thousands of customers around the world, MadgeTech is proud its calibration lab is officially operating by global industry standards. The ISO/IEC 17025 accreditation applies to specific MadgeTech temperature data loggers, including top-selling products such as the HiTemp140 series and the RFOT. To view all of the MadgeTech data loggers that will bear the ISO/IEC 17025 certification, click here. To accompany this certification, MadgeTech is also making it easier to recalibrate products by launching a new webpage. The new recalibration page, offers customers a simplified way to place their orders with a five-day turnaround upon receipt of product(s). For more information about how MadgeTech’s state-of-the-art monitoring solutions can help validate your industry’s regulatory requirements, contact a sales representative at (603) 456-2011 or email them at sales(at)madgetech(dot)com.